I actually finished something for a change! Lately it feels like everything's a work in progress, but yesterday I put the finishing touches on this beauty. 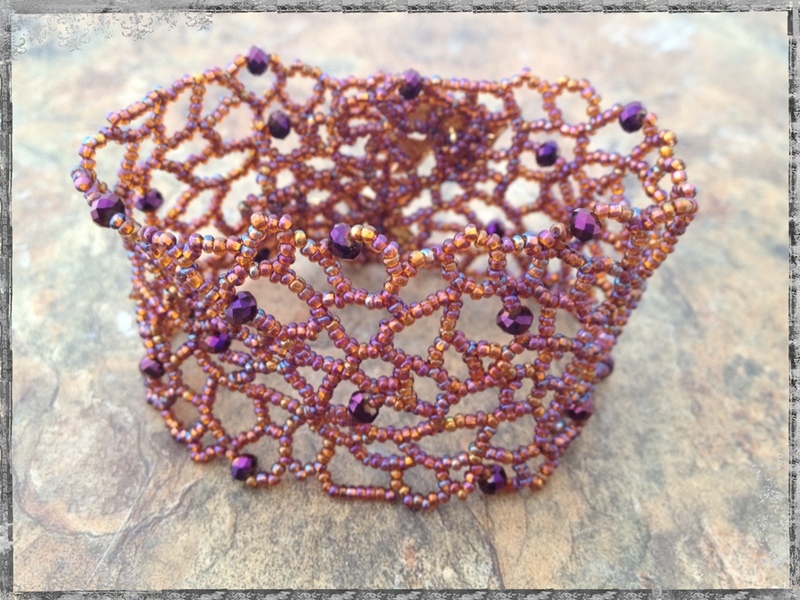 The seed beads are Czech glass with that rainbow finish I love as it reminds me of copper patinas on metal. I paired the seed beads with some lovely, deep purple Chinese crystals with flashes of the same orange/pink/golds. So what did I end up going with you ask? The tropical fish won the day! The blue Czech glass might be a more elegant finish - better suited perhaps to a formal dinner out. The butterfly would have been simply beautiful. But I loved the fun and sass of these little guys. I just added it to Etsy this morning: this is my first bracelet I've actually added for sale there. Several friends have been pushing me to list some of my larger pieces (besides just earrings) on the site. Their suggestion is to think of it as a portfolio of my work. I'm hoping/planning to add additional larger pieces over the next several weeks. We'll see how it goes. I've also added a listing for kits in this color way, so you could make your own private coral reef. This is so beautiful! I love the finish on the beads and the fish are perfect! Gorgeous Karen, I love the colors and the fish look right at home! When I saw this I thought "fish in the reef", then scrolled a little further and saw that you had the same idea -- great minds, eh? It's a really cool bracelet, and the color mix is beautiful. 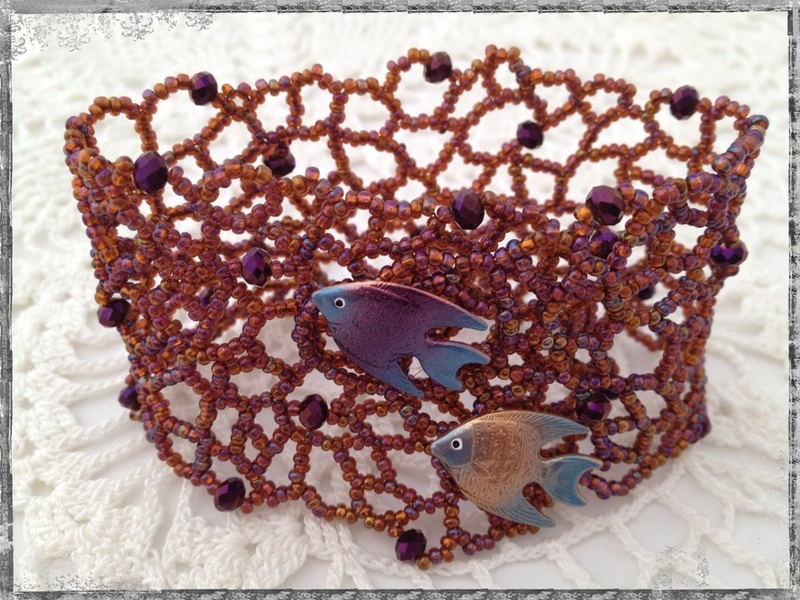 Excellent choice, Karen -- the fish look happy in their beautiful "net" and the larger beads remind me of floats. Good job! Of course the fish won the day- what else could you have chosen? Awesome work of art, my dear. Those little fish are so cute, Karen, but I think they are too smart to get "caught" in the net. Maybe they'll stick around and admire those beautiful Czech glass beads (my favourites). By the way, your email last week was just the encouragement I needed to decide to finally start my blog; I celebrated my birthday yesterday by giving myself a gift that I hope will keep on giving: my own place to interact and undertake. Thanks for egging me on!